This floaty over-shirt was just waiting for me in a charity shop in Preston, just before I went away on holiday with my husband. I picked it up, because I thought it might look smart for going out to dinner with a black spaghetti strap top underneath it. I am glad to say, I was right. For our holiday, we went camping to Cornwall and the weather verged between black clouds and rain, and hot sultry hazy days. The only thing they all had in common was the humidity. So when it came time to go out for dinner, things had to be light and cool, even late at night. We went to Tintagel, which was beautiful and filled with gorgeous pubs. This meant I wanted to dress nicely, because it was my holiday and I so rarely get to go on ‘dates’ with my husband, but also I didn’t want to OVER dress. Because, y’know, that’s embarrassing as all hell, when you stick out amongst the jeans and jerseys. This lovely floaty over-shirt allowed me to strike the right balance. The colours are gorgeous, just the right ones to suit me, red and rich plum colours, trimmed with black. There is a little tie just under the bosom, which gives the top a little shape without it being too close fitting. The long sleeves and the handkerchief hem is light and gives it a little bit more shape. I particularly love the sleeves on this top, they are light and have a nice bit of detailed pattern on them, but they aren’t too fixed in shape. This means that the underarms aren’t tightly fitted, which allows a little more freedom, and in hot weather allows a little more ventilation, and cuts down on that uncomfortable sweaty feeling! I’ve had a few tops made out of this sort of synthetic material, and the tight fitting under the arms has been a big problem with some of them. This sort of thin material very rarely has elastic build into it, it’s often pretty rigid along the seams. This top with the short, loose sleeves has been more comfortable than the long sleeved ones I’ve had previously. For £1, this was an absolutely bargain. Marks and Spencers are rarely a disappointment, and this has been a great choice. It’s strange to think that this might be sold for as much as £15-£20 … I’m not sure I would ever pay that much, but for £1 this was a nice little purchase. I grew up in North Wales for eighteen years and for the last fourteen years I’ve called the North West of England my home. But there is another corner on this island where my heart feels ‘home’. After seven years of relationship, including 1 year of marriage, I finally convinced my husband to come to North Devon with me. Specifially to Woolacombe. I was 11 the first time I went to Woolacombe. My parents are convinced I was younger, but I’m convinced it was 1993, because Nicky Campbell was there with the Radio 1 Roadshow the first day we woke up, with East 17 performing there. It can’t have been earlier. East 17 weren’t big enough before that. Woolacombe is a small village next to a 2+mile stretch of golden, blue flag beach. It’s one of the most beautiful places I have ever seen. The view coming over the cliffs on the approach to the sea is stunning. I have heard rumours over the years that Woolacombe, or at least Mort Point, is located on a ley line. I can absolutely believe it, given some of the things I’ve experienced in Woolacombe. For starters, it lies in the path of the gulf stream. Swimming in the sea off Woolacombe beach is a very strange experience as the waves alternative between freezing cold and warm as bath water. The coast is also home to the Barricane Beach – sandwiched between two larger sandy beaches, the Barricane Beach is made up entirely of crushed shells, many of which have been swept all the way to Britain from the Carribean islands. And finally, with Lundy Island lying off shore, I can absolutely believe that there is a mystical energy surrounding Woolacombe. Even my husband commented that the town possessed an energy which he has never experienced in any other British seaside resort. When I visited the town with my family, we stayed in a few different places, but most often we were based at the Castle Hotel. This time, however, my husband and I were camping at North Morte Farm, just up the cliffs above Woolacombe in the village of Mortehoe. I’d visited Mortehoe before, but this village had more frequently been my mother’s haunt, as she used to visit it when she made holidays to Devon on her own. The white building in the centre is The Ship Aground public house. This became our home from home for many of our mealtimes. It’s a character filled pub, with stools and tables made from old barrels, giving nods towards the pub’s history as a smuggler’s haunt. The atmosphere was cheerful, the staff friendly and welcoming, the menu home-cooked and tasty and the rum selection plentiful! Our base for this holiday was North Morte Farm, a recommendation from my mother who discovered it on one of her walks. …and the sunset was equally lovely. Even the clouds on our last day couldn’t spoil it. As a child I always felt that Woolacombe was a place where you could almost fall off the end of the world into the sky because the horizon and the ocean were so open and so big. It was a relief and a delight to discover that feeling hadn’t disappeared as I’d grown older, and nor had that sensation of ‘coming home’ that flowed over me as I walked along the coastal paths of Woolacombe and the cliffs of Mortehoe. It was very special for me to be able to take my husband to this place, because I feel as much a part of this place as I do of Wales, as if the cliffs and the rocks and sea had a hand in forging who I am as a person today. The next stage in our holiday would be a venture into Cornwall, not only to visit Bude, but to visit Tintagel, which was part of my husband’s childhood. I remember the first time I encountered Rosamunde Pilcher. When I was about 15 I watched a TV Dramatisation of Coming Home. It had an all-star cast, with names as illustrious as Peter O’Toole and Penelope Keith and Joanna Lumley, alongside then-newcomers Keira Knightly and Paul Bettany. I loved the story, the scenery, the world that Pilcher had created. I read Coming Home as soon as my mother obtained a copy and discovered, to my initial dismay and subsequent delight, that the story was vastly different to the TV portrayal, but infinitely better. There were new characters added to the mix who outshone their counterparts, and Pilcher’s description of the Cornish landscape and the works of art created by her characters were even more shining and brilliant than anything a TV producer could conjour up for the screen. My family had been visiting Devon since I was 11 years old, multiple times a year. I already knew the charms of the south western coastlines of England. For the first time, I began to think that Cornwall might be worth investigating too. Fast forward a few years to my mid twenties, where I first read The Shell Seekers. I had vague memories of the TV adaptation starring Angela Lansbury and my mother cherished a battered copy of the book, but I had been too young to really pay attention. Whereas Coming Home had a fourteen year old girl as its primary heroine, The Shell Seekers told the story of a 64 year old woman. Not really something I could engage with at the time. But by the age of 24, I’d completed my degrees in English and was training as a teacher, equipped with the skills and willingness to engage with characters who did not reflect my own position in life. Consequently I fell in love with Penelope Keeling. Her vivacity, generosity and open hearted approach to life sang to me and laid out a life that I longed for. Not one filled with money or prosperity, but with love and friendship and companionship. Cornwall once more provided the backdrop to a significant portion of the story, with another artist taking centre stage. The descriptions of Cornwall through the eyes of a devoted, talented painter were delicious to read and I could see Pilcher’s world so clearly in my head, it was as if the paintings already existed and had become old friends. Fast forward another few years, and now I am 32 and have been married to my best friend for one year. We planned a trip away to the South West, as discussed in my previous entry, and first stop on the agenda is the Rosamunde Pilcher Shell Seekers Exhibition at Bude Castle. I am as excited as a small child, not only to be seeing these works of love and homage but to finally be visiting Cornwall, which I feel I know as well as Devon, experienced through hundreds of re-readings of Pilcher’s books through some of the best and worst times of my life. It’s always fascinating to see how other readers engage with the books that you love. Which parts reach out and touch your heart, which bits sing to your soul. The paintings that touched me most deeply were the ones which were inspired by my favourite sections of the books. ‘I would have understood’ by Lynne Holehouse moved me to tears. The end of the novel and the discoveries made by Olivia Keeling about her mother’s life and history touched me very deeply. When my own grandmother died, I realised how little I had actually known of her life and how much of her personality, beyond her role as my grandmother, had passed me by and become lost to history. The longing to reach for someone through the written records of their life is a feeling well known to me and I felt that this picture captured that desire beautifully. Lynne’s work ‘Darling Richard’ carries the same sadness. How a man’s existence and life, after death, can be reduced to so little. I was reminded of the sadness I felt reading the end of ‘Fried Green Tomatoes At The Whistlestop Café’ by Fanny Flagg, where Evelyn realises how little is left of the friend she had come to cherish, with all of her possessions and memories condensed into a small box. People do not automatically live through the possessions they leave behind, which may be few and may seem insignificant to those who do not understand their relevance. They live on through memories and their places in people’s hearts. Not all of the works were framed in sadness though. Clair Roberts’ depiction of ‘Doris’ made me laugh, it was so sparky and filled with life and cheek and absolutely captured the spirit of that character, even down to the little pinky sticking out. And when asked to vote for my favourite, I had to opt for Tim Martindale’s beautiful photograph of the Bude sea pool though. I felt that in one shot, he had captured Pilchers Cornwall in a single sky. A combination of thunderous dramatic cloud, chalky blue flashes of sky, the brilliance of the light all combining with the wildness of the sea and the rocks alongside the domestic safety of the pool. For me this was a stunning summary of Cornwall’s power and beauty, the same no doubt that captured Pilcher’s imagination and drew her back to these places for inspiration time after time in her works. Cornwall was a magical place to visit and Bude in particular now occupies a special place in my heart. For a woman who loves the domestic peace and quiet of canals, the happiness of family beaches, the energy of rivers and the wild power of the British coastline, Bude quite literally offered the combination of these features. Alongside a backdrop of history, social vibrancy and a sense of pride and satisfaction in its endeavours and strengths, the town was a fantastic place to visit. I will certainly be going back, but I am delighted that I made this trip in particular, to see an exhibit which touched my heart very deeply with its respectful celebration of my favourite author, Rosamunde Pilcher. A year ago today, I married my best friend. The year has been a hard one, but one we have weathered together as partners in all ways. My husband is self employed and often works seven days a week. I work full time and run my own business on top of that which takes up many of my evenings and weekends. This is aside from our writing efforts and commitments and battles to maintain good health. After a year, we were in deep need of a break, not only to celebrate our anniversary but to rest and enjoy some genuine time in each other’s company. Having invested a sizable amount of money in a canvas bell tent and a lot of luxury camping equipment, we decided to test it out with an extended holiday. The main question was where to go? For some time I’ve wanted to take my husband to North Devon. My family visited Woolacombe every year, sometimes as often as three or four times a year, since I was 11. The place is as much a part of my childhood as Wales, where I grew up. I longed to share this with him. In return, he wanted to take me to Tintagel, in Cornwall, the birth place of the myth of Arthur, where he had spent some time on holiday in his teens. Then this spring, something caught my eye on Twitter. The plan finally came together. 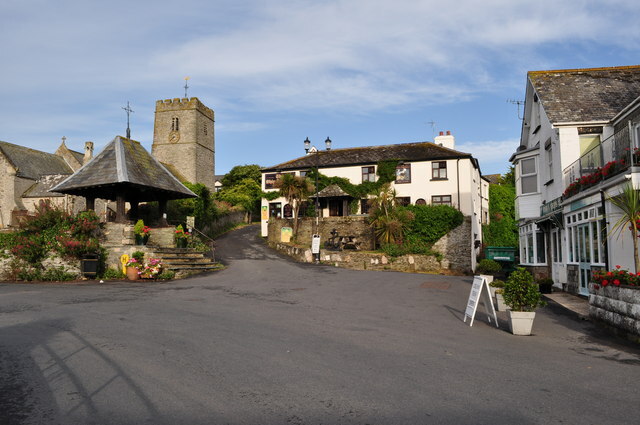 We made arrangements to base ourselves in North Devon, at North Morte Farm, with trips planned along the Atlantic Highway into North Cornwall to Bude and Tintagel. The next few entries on this blog will be about our experiences on this holiday, at the festivals, on our visits and during our stay on one of the most beautiful parts of the country. Stay tuned for reviews, photographs and discussions about why I love this area of the country so much, and why it was such a pleasure for me to be able to share it with my best friend, my husband.